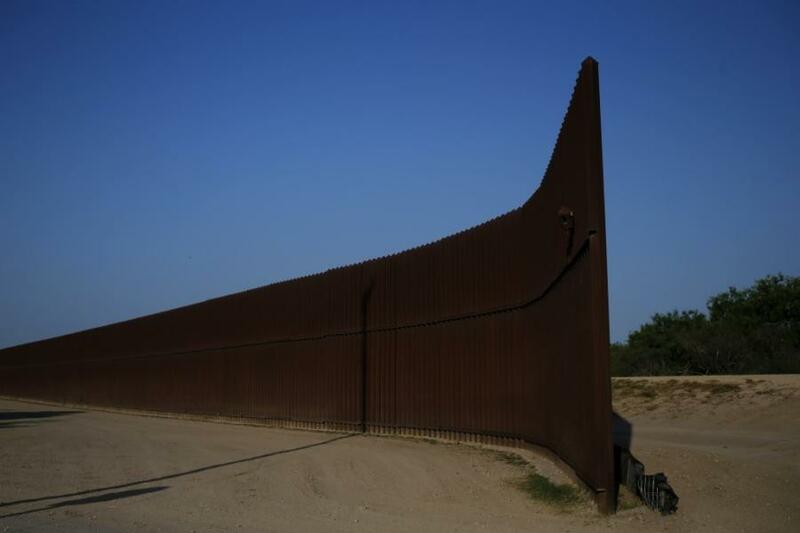 HOUSTON (AP) The U.S. government is preparing to begin construction of more border walls and fencing in South Texas' Rio Grande Valley, likely on federally owned land set aside as wildlife refuge property. Congress last March approved more than $600 million for 33 mi. of new barriers in the Rio Grande Valley. U.S. Customs and Border Protection has pushed ahead with building what's already funded. That construction was often described as fencing, and the government funding bill that included construction was supported by some Democrats in the House and Senate. CBP refers to what it plans to build as a "border wall system." According to designs it released in September, CBP intends to build 25 mi. of concrete walls to the height of the existing flood-control levee in Hidalgo County next to the Rio Grande, the river that forms the U.S.-Mexico border in Texas. On top of the concrete walls, CBP will install 18-ft. steel posts and clear a 150-ft. enforcement zone in front. Maps released by CBP show construction would cut through the National Butterfly Center, a nearby state park, and a century-old Catholic chapel next to the river. Many landowners oppose a border wall and have vowed to fight the U.S. government if it tries to seize their property through eminent domain. Court fights over condemning land could take months. CBP said in its statement that it intends to start construction on federally owned land. Environmental advocates expect the government to use land that's part of the Lower Rio Grande Valley National Wildlife Refuge. The refuge consists of dozens of parcels of land purchased over the last 40 years to create a corridor for endangered species and other wildlife. The Department of Homeland Security can waive environmental restrictions to construct a border wall and issued its waiver for Hidalgo County in October. A coalition of environmental groups has sued DHS over its use of waivers. That lawsuit is still pending. Congress last March required CBP not to build in the Santa Ana National Wildlife Refuge after a public outcry. But it didn't exempt the Lower Rio Grande Valley refuge. "Santa Ana was not a big enough refuge to sustain all the wildlife down here," said Jim Chapman, a longtime resident of the Rio Grande Valley and member of the group Friends of the Wildlife Corridor. The National Butterfly Center released the text of an email sent by an attorney from the U.S. Department of Justice. The lawyer, Cliff Stevens, said in the email that construction will begin in mid-February "on federally owned land east of Bentsen State Park." Directly east of Bentsen State Park is a refuge tract called El Morillo Banco, which is between the state park and the butterfly center. DOJ declined to comment on the email, and CBP did not respond to several requests for comment. Land already in the hands of the government becomes an easier place to start construction quickly, said U.S. Rep. Henry Cuellar, D-Laredo. Cuellar has introduced a proposal that would instruct CBP not to build border walls in several places that have environmental and cultural significance. "The easiest way, historically, is to go to public lands, because who's going to fight them?" he said. The butterfly center said on Facebook that a local police officer had declared all their property south of the levee to be off limits. The center says it intends to take legal action. Chapman said that despite months of protests and meetings, he hadn't seen "any attempt" from the U.S. government "to acknowledge and to take the needs of wildlife into account." "If you were going to design a border wall with maximal impact, you would do exactly what they were doing," Chapman said. "You couldn't do it worse."